The Oregon Cascade Range holds a treasure trove of mountain lakes, both large and small. Nearly every summer since I was a kid I have made at least one journey to camp at a lake in the Cascades. 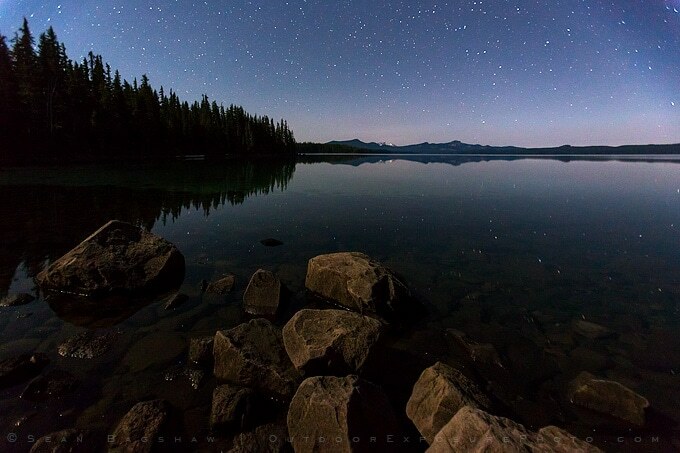 Oregon’s mountain lakes make for excellent photography in any light, but photographing them under a canopy of stars and illuminated by moonlight, headlamp or campfire can produce magical images. Until recently, night photography has been a daunting undertaking practiced by only the most skilled and dedicated few. With film, exposure times had to be very long (10 minutes to several hours) to capture enough light to see anything, causing the sky to streak into rings of star trails. Make one mistake in exposure time, focus or composition and the image would be ruined. If you could get one good image per night, you were doing well. Digital cameras, particularly the most recent generation, have changed that. Cameras like the Canon EOS 5D Mark III and the Nikon D700 can produce very low noise images at very high ISO settings. This makes it possible to achieve properly exposed night images in under 30 seconds. Photographers can take more night images in less time allowing the learning curve to be shorter and mistakes to be corrected. It also makes it possible to photograph skies with sharp stars instead of star trails. This past summer I visited Indigo Lake and Waldo Lake in the Cascades on separate trips. On both occasions I took the opportunity to spend some time on the lake shore in the dark with my camera. 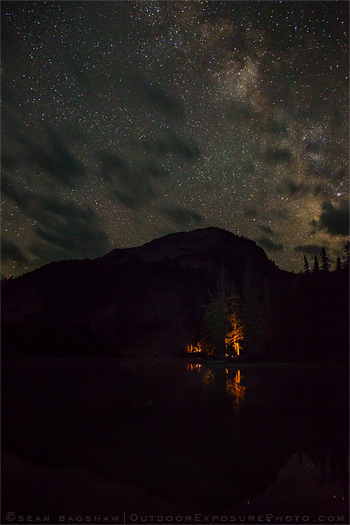 Images that capture and reveal the mystery of night are possible without too much equipment and some simple techniques. What you need: A tripod, a digital SLR camera that produces low noise at high ISOs and a fast, wide angle lens. A lens with16mm focal length equivalent and an aperture of f/2.8 are preferable but expensive. A 24mm focal length and an aperture of f/4 can also do the job in a pinch. A headlamp is also helpful. My technique: I often scout the scene in the daytime and pre-visualize my compositions. 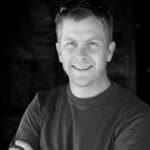 Setting up the camera in the dark and getting the focus right is often the biggest challenge. Focus needs to be at infinity to get focused stars, but the exact focus will vary slightly with each lens. For my lens I have done test focusing on very distant objects during the day and made note of that position on the focusing ring. I can set the focus at night just by looking at the focusing ring and not attempting to actually focus through the viewfinder. I frame the scene as best as I can, often with the help of shining my headlamp past my camera as I look through the viewfinder. I set my camera to manual and I start with settings of f/2.8 at 30 seconds at ISO 3200. After taking the first image I evaluate exposure, focus and composition on the screen on the back of my camera and make adjustments as needed. Once I have the focus and composition set I will take four or more photographs, adjusting the ISO and shutter speed in each slightly. I usually take two exposures at ISO 3200, one at 30 seconds and one at 15 seconds. Then I will do the same again only at ISO 1600. If it is a particularly dark night then I might also try exposures at ISO 6400. 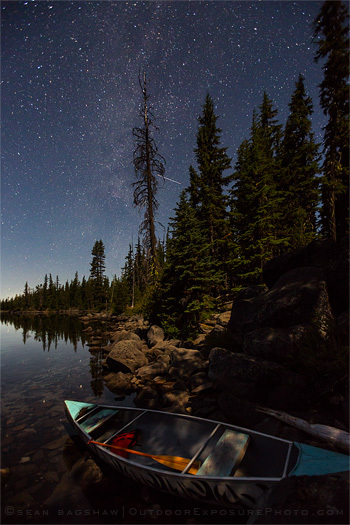 Lower ISO settings will produce less noisy images, while shorter exposure times will produce sharper star points. By taking exposures at different settings, I can analyze each one carefully on my computer back home and decide which has the best quality. 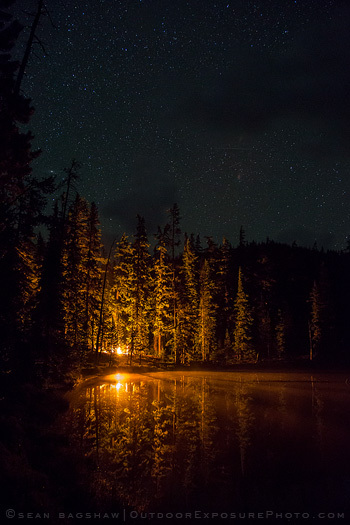 Next time you are enjoying the stars while sitting by your campfire at one of Oregon’s Cascade lakes, take the opportunity to capture that experience in a photograph.